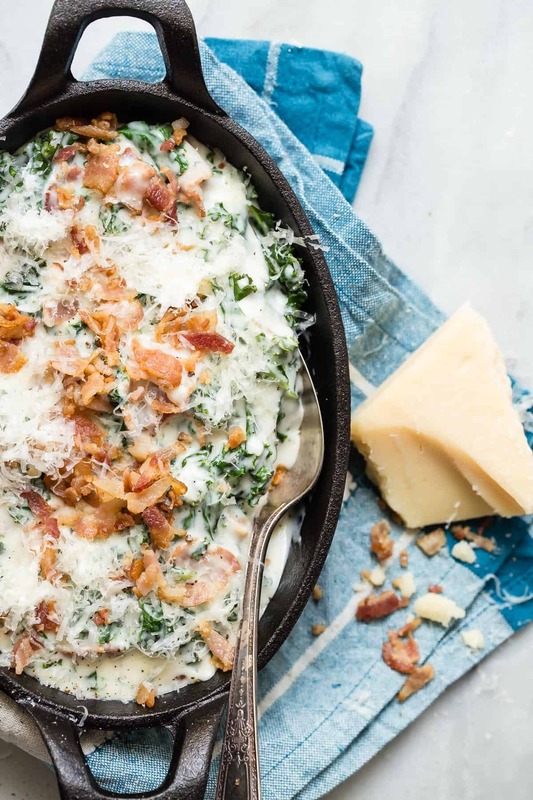 This Creamed Kale with Bacon and Parmesan cheese will easily make you forget about using spinach. Creamy with crunchy chunks of smoky bacon, this is a must-have side dish for the holidays! My last post in a series with Pernod Classic has fallen upon me and there’s a few things I’ve learned along the way. 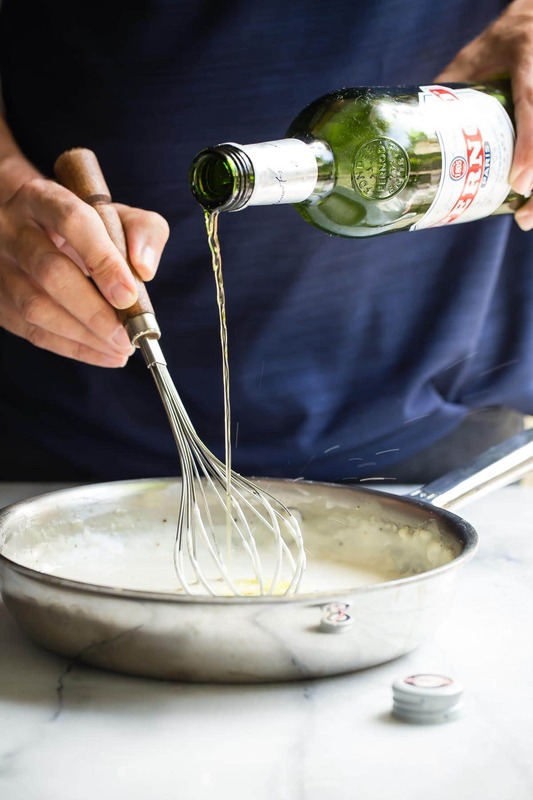 If you have Pernod Classic hiding in your booze cabinet, stop staring at it and start cooking with it. Pernod tastes really unique but the flavor mellows out a lot once it’s been added to food. My favorite dish from the four I made was probably the Apple Bread Pudding…that sauce! But this creamed kale is so close, it would be a photo finish if it was a race. But today, it’s all about the side dish and one of my favorite things to eat is creamed spinach, which only seems to raise its head up around the holidays. What’s up with that? I did a little experimenting and it turns out that creamed kale is just as tasty as its green cousin spinach. Well, maybe the bacon played a teeny part, oh and a splash of Pernod Classic as well mixed into the sauce or maybe the Parmesan cheese. So many good tastes happening in this side dish. In fact this dish is so good, it could probably be a side or as a really indulgent main course that is definitely not low calorie. The whole thing starts off with a roux. This is just a combination of melted butter and flour which is then combined with warm milk. 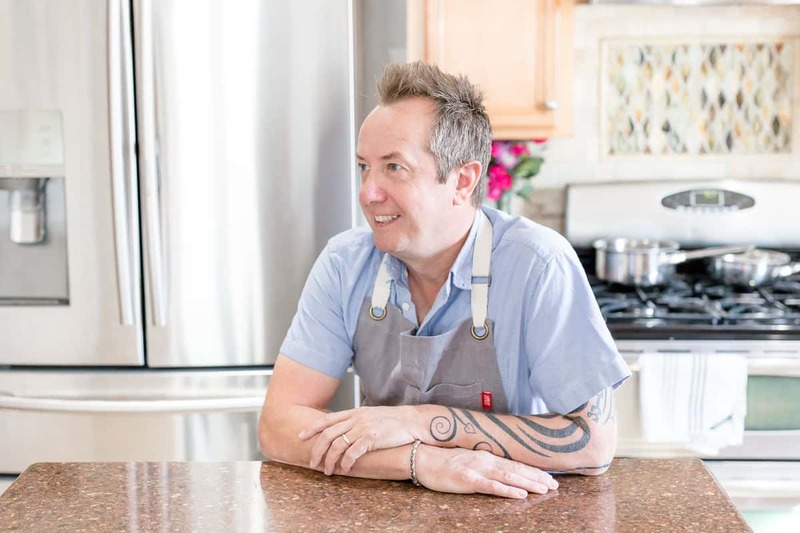 It’s the base for so many great sauces and even lasagna, giving that creamy layer between the pasta and the tomato sauce. Adding the Pernod Classic to the thick rich sauce provides just the right amount of kick. As I mentioned already, the famous anise flavor mellows out once it’s been simmered for a few minutes. Bacon is all through the creamed kale and also on top. I used 10 slices so there’s no risk of missing any when you scoop some onto your plate. Bacon should be plentiful. The kale is roughly chopped, but chop it finer and you could use this as a really over the top dip and serve it with some crusty french bread. 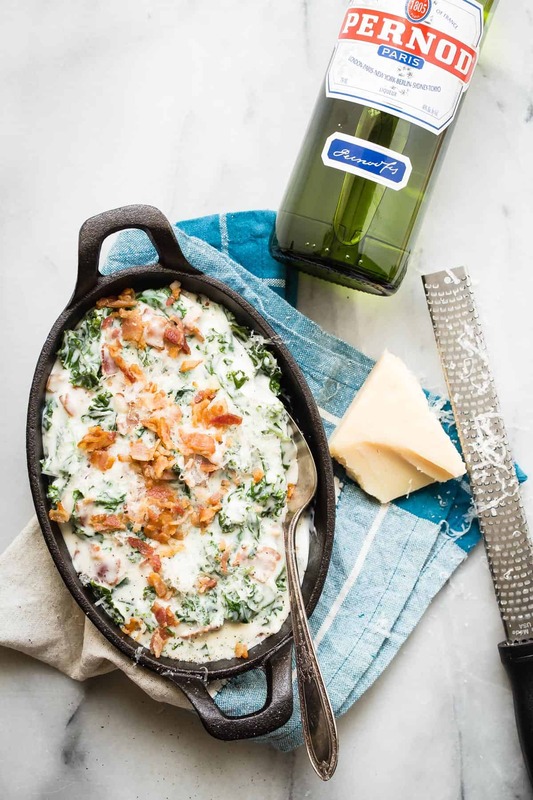 For now, promise me you’ll try this instead of creamed spinach when the holidays come around. I know I’ll be serving it beside my usual prime rib at Christmas! Here’s a cocktail perfect for sipping on while you make that awesome Creamed Kale Spinach. 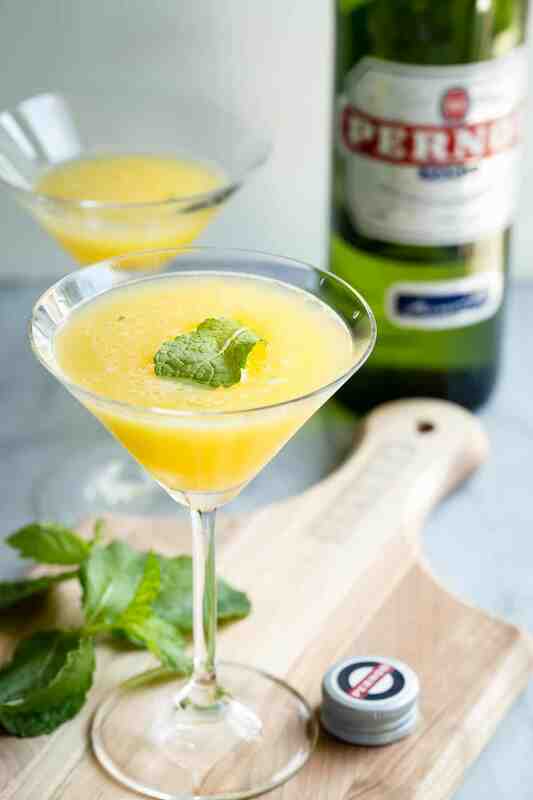 Fresh orange juice and Pernod Classic filled with crushed ice and fresh mint. This post was part of my collaboration with Pernod Classic. All text and opinions are my own! In a large pan, cook the bacon until almost crispy and then transfer to a paper towel to drain. Reserve 1/4 cup for garnishing. Empty the excess bacon fat from the pan. Cut the center part of the kale from the leaves and discard. 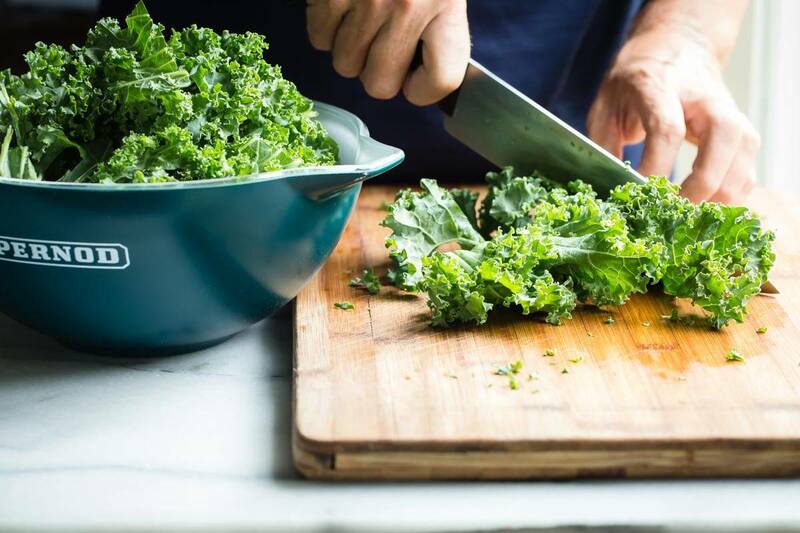 Roughly chop the kale leaves into small pieces and add to another pan with a quarter cup of water. Cover the kale and cook for 3-4 minutes and it has slightly wilted. Set aside. Add the butter and melt over a medium heat. Add the flour to the butter and whisk until no lumps are visible. Begin gradually adding the milk in stages, making sure to whisk after each addition before adding more. Once all of the milk has been added sprinkle the grated Parmesan into the sauce and whisk to avoid any lumps. 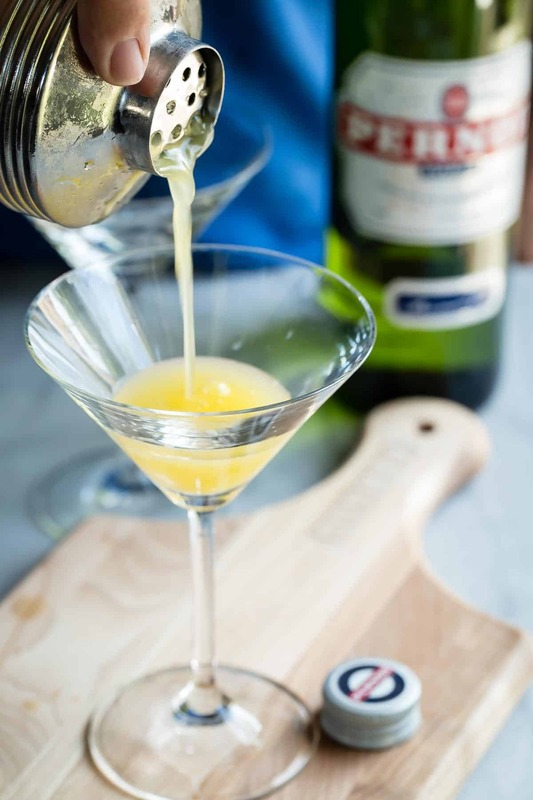 Pour the Pernod Classic into the sauce and whisk again. 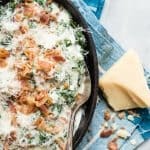 Take the cooked kale and add it to the cream sauce along with the chopped bacon and fold through to completely coat the kale. Serve at once with extra Parmesan and bacon sprinkled on top. In a cocktail shaker, combine the ice, Pernod Classic, orange juice and mint. Garnish with more fresh mint and serve at once. Kale, bacon and cheesiness? Uh, ya…SO all about this! I could eat it all for dinner! I’ll take the whole pan right now!! Seriously, so cheesy!! I could easily eat that pan all by myself! God that looks good! I could devour the whole thing solo. 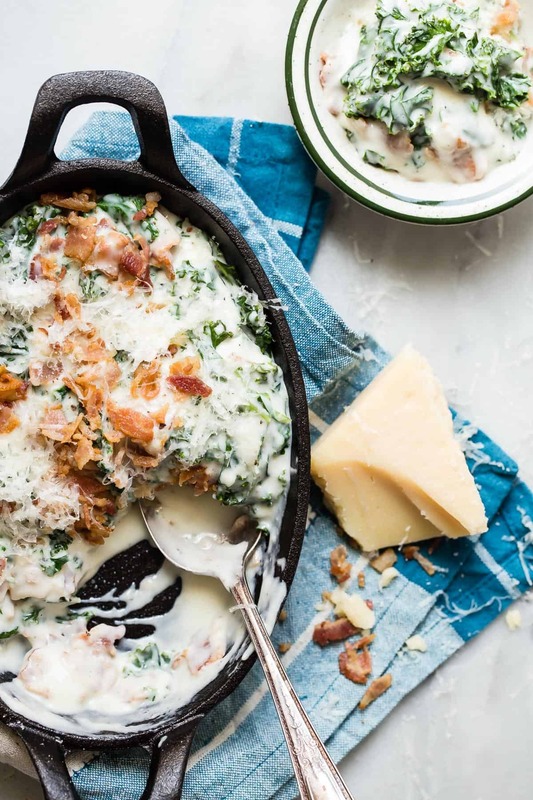 Creamed spinach is my love language but this version with kale just might make me want to have an affair. What a smart idea for the holidays. When I lived in France, Pernod was a staple in my host family’s cabinet. I’ve loved it ever since! This looks amazing, Gerry! Yes to all of this! Such a great way to use Pernod! Dare I say that I’ve never had creamed spinach? OR creamed kale for that matter! I think you’ve persuaded me to give it a try though! Love that the kale holds its texture a bit too! This is absolutely amazing. I can’t eat kale but some of my besties love it. So this has to happen next time they visit. They will love it. I mean look at all the creamy goodness. I would dive right in the middle and eat my way out if I could. And Pernod, seriously. THE BEST. All I can say is why do I not live next door to you? Ha.